So you’re looking for a beach escape but want something a little more memorable? Well, we’ve created an experience like no other where you’ll be exploring the Belizean jungle one minute and kicking back in your very own island paradise the next. During your eight-day trip, we’ll show you all the best-kept secrets this small Central American country has been hiding and you’ll return an expert on all things Belize along with some incredible stories to share. You’ll start by unleashing your eco-chic warrior at Chan Chich Lodge where you’ll come face to face with ocelots and pumas, (and if you’re lucky an elusive jaguar) before resting your head at the exclusive Cayo Espanto – a private island retreat and the perfect ending for an unforgettable honeymoon or romantic getaway. Touch down at Belize’s international airport, where you’ll then be able to savor some spectacular aerial views of tropical wilderness below as your private charter flight whisks you away to Northern Belize. Off the beaten track you can unplug from the rest of the world and unwind at your stunning jungle retreat. Nestled in the heart of ‘La Selva Maya’ for the next three nights you’ll be surrounded by ruins of an ancient civilisation and tranquil rainforest where you can get back to nature in serious style. So prepare to unleash your secret ornithologist as with 350 species to see and an expert guide your intrepid nature walks will certainly be colorful. 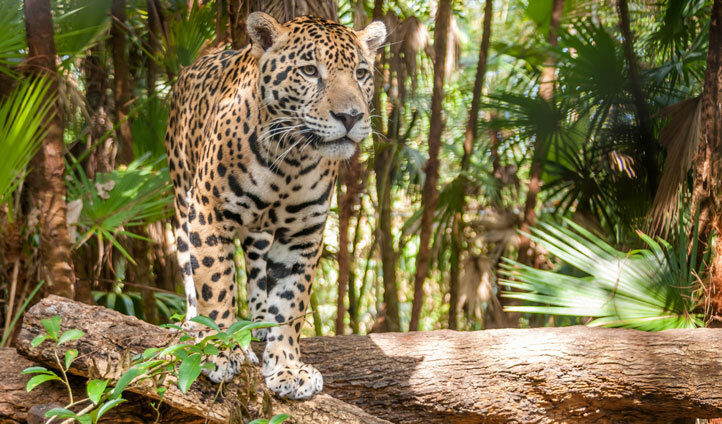 If you’re more of a thrill seeker then take a walk on the wild side as you set off in search of jaguars and pumas in your 13,0000 acre back garden. With Mayan ruins and temples like something out of an Indiana Jones film at your doorstep, you’ll learn all about the area’s rich history by the end of your stay. After all your adventures into the jungle, you’ll probably want to relax – what better way to end the day than by unwinding with a glass wine in the Jacuzzi or saddling up for a peaceful sunset horseback ride. So you’ve had your nature fix and are longing for some sun, sea and sand – well we’ve got you covered with not one but two island experiences. Watch the scenery change from rugged jungles to pristine sands and azure waters as you’re transported by private flight to Ambergris Caye before taking a boat to Cayo Espanto. Here you’ll find a private island hideaway made up of just seven villas that’s all yours for the next four blissful nights. If you want a dose of civilization, take a boat to nearby Ambergris Caye, Belize’s largest island and sample the local fare at one of the laid-back waterfront restaurants or visit the charming town of San Pedro. You’ll have the chance to see two of Belize’s stunning atolls as well as the largest Barrier Reef in the Western Hemisphere (second largest in the world) as you head to Turneffe Islands on an exhilarating helicopter ride. You’ll be able to awe at the dazzling Blue Hole, the largest ocean sinkhole in the world with your guide who will be able to explain the region’s geology in great detail. 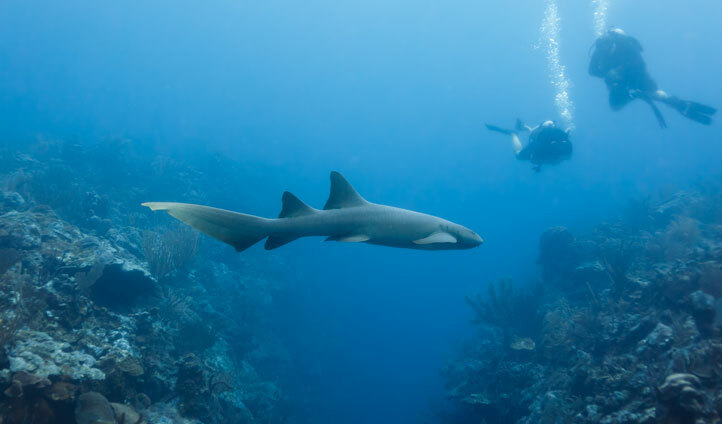 For underwater adventurers get ready to take to the water to glimpse the underwater beauties Belize has to offer as you snorkel through Hol Chan, a marine reserve that’s home to over 100 different species of fish, coral, turtle, just to name a few. And if you’re feeling daring, take a dip into Shark Ray Alley, an area populated with nurse sharks and southern stingrays. For an enchanting way to end your trip, we’ll take you to a deserted island spot where you’ll enjoy a delicious picnic with only the crashing waves as your soundtrack, and the sunset as your backdrop.